Beth A. Robertson resurrects the story of a group of men and women who sought to transform the seance into a laboratory of the spirits and a transnational empirical project. Her findings cast new light on how science, metaphysics, and the senses collided to inform gendered norms in the 1920s and ’30s. She reveals a world inhabited, on one side, by psychical researchers who represented themselves as masters of the senses, untainted by the effeminized subjectivity of the body and, on the other, by mediums and ghostly subjects who could and did challenge the researchers' exclusive claims to scientific expertise and authority. Robertson, B.A. (2016). 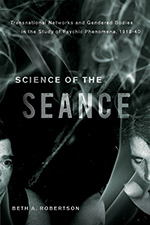 Science of the Seance. University of British Columbia Press.